The FCC has granted applications for two FM boosters that would be commonly-owned by LPFM stations and will specify those LPFMs as their primary stations. The applications were filed in 2015 and 2016 by the advocacy side of REC Networks on behalf of two California applicants. KWSV-LP in Simi Valley also known as "99.1 The Ranch" is located in the foothills to the east of Simi Valley. Because of its close proximity to the San Fernando Valley, the protected contour of the primary station extends into the northwest San Fernando Valley to include Chatsworth (where REC Networks started in 1984). The area to the east of the station is blocked by higher terrain. KWSV-LP identified a site in the Chatsworth Hills that could be used for a translator to reach the San Fernando Valley. The site will operate 6 watts into a directional antenna pointed to the southeast and should provide coverage in the San Fernando Valley west of the 405 San Diego Freeway. KXRN-LP in Laguna Beach, a first-generation LPFM station, known to the locals as "KX 93.5" is located right in center part of Laguna Beach along the Pacific Coast Highway. 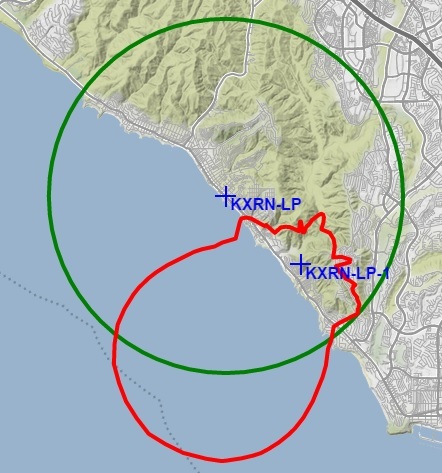 Because of the mountainous terrain along PCH to the south towards San Clemente, there is terrain that goes all the way to the coast thus blocking the KXRN signal south of that point. Because of KXRN-LP's low level and low height above average terrain due to flatter lands to the north, KXRN's protected contour is nearly a perfect 5.6 kilometer circle, including in the blocked area to the south. A site overlooking the area to the south of the blocking terrain was identified and with a 10-watt signal into a directional antenna beamed towards the ocean, KXRN-LP will be able to fill-in their service area without the protected contour of the booster going outside of the primary station's contour on land (it's OK over the sea, just not on land). FM Boosters are authorized under Part 74, Subpart K of the FCC Rules, which is the same subpart for FM translators. FM Boosters are normally used by full-service FM broadcast stations in order to "fill-in" an area that because of terrain is not able to receive the primary station's broadcast signal. FM Boosters may only be placed in a manner where the proposed protected service contour of the booster is entirely within the proposed protected service contour of the primary station. FM Boosters are limited in power to 20% of the maximum ERP for the service class of the primary station (for LPFM, that would mean a 20 watt ERP maximum). Like translators and LPFM stations, FM Boosters are secondary status. Other than the upcoming application freeze, new FM Boosters can be applied for at any time without having to wait for a filing window. In 2009, an organization called Great God Gospel & Educational Station, Inc. filed a request for an FM Booster for use by station WITG-LP in Ocala, Florida. The FCC denied the application citing that because of the cross-ownership rules at the time, LPFM stations can not own other media holdings such as FM translators and boosters. During the appeal process WITG-LP claimed that the FM Booster was not a translator but instead was merely an extension of the existing station. At Review, the full Commission upheld the Audio Division's denial of WITG-LP's application. In 2015, REC Networks and Strategic International Ministries filed the booster application for KWSV-LP . In the waiver request, REC stated that contrary to WITG-LP's argument, an FM Booster is like a translator and actually, it is more spectrum effecient since it uses the same channel as the primary LPFM station. In light of the changes in the LPFM cross-ownership rules in 2012, REC felt that the booster can be assigned to an LPFM station and counted as one of the two translators that LPFM stations are permitted to own. In 2016, REC and Laguna Radio, Inc. filed the second application for KXRN-LP. On this application, we made the same arguments that were made on KWSV-LP and we added an additional compelling reason related to public safety along California's famous Pacific Coast Highway. The FCC agreed with REC's arguments and granted both booster applications on June 22, 2017. Normally, FM Boosters normally do not have to make a second or third-adjacent waiver showing because full-power rules normally require second or third-adjacent channel protection. The KWSV-LP1 application demonstrated how second or third-adjacent channel waivers can be applied for use with boosters. The booster applications were able to waive §73.860(b)(3) of the rules which requires FM translators for LPFM stations to be fed directly over the air. Since a booster operates on the same channel, they are normally permitted to be fed through alternate means. This decision upholds that LPFM stations are entitled to their protected service contour area that may lay outside of 5.6 kilometers from the transmitter (this goes against a statement made in WITG-LP that stated that LPFM stations need to accept their terrain shortfalls even inside their protected contour). REC has already notified both organizations and we look forward to hearing their new stations on the air! Please note that very few LPFM stations would be able to benefit from translators. The ones that would benefit the most are those surrounded by substantial terrain. LPFM stations are strongly encouraged to contact REC for filing assistance or even just for a consultation if you plan to file yourself or with someone else.